Part of a collaborative animation project based on the popular "Rhythm Heaven" series, I reimagined the iconic minigame "Samurai Slice" in my own style with ToonBoom. 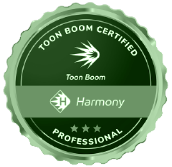 Animated in Harmony Premium for Certification as a ToonBoom Professional. Flash animations for an international Augmented Reality Game based on Gravity Falls. Bacteria Infomercial from Bret Linne on Vimeo. Flash/Animate CS4, based on the Rhythm Heaven game "Screwbot Factory 2"
Animation test for a Flash Webseries "The Bedfellows" animated using a sample clip. Flash animation based off Rhythm Heaven "Munchy Monk 2"